I have been a teacher of English for 24 years and this much I know about teaching disengaged 15 year old boys how to write. Teaching disengaged boys how to write with deliberate purpose seems to be one of our most important challenges in schools. My most popular blog touched upon this particular pedagogic challenge; when I was asked by Helene @hgaldingoshea to contribute to the recent #PedagooLondon event I decided to revisit that blog and explain in more detail how I teach boys to write. When I was preparing my presentation, I was surprised by how much more I learnt about the teaching and learning process; another reminder of the importance of reflection in improving our practice, perhaps? It’s not just about doughnuts. Lots of the things I wrote about in that first blog were about generic relationship-developing strategies. The success of those boys wasn’t really down to eating tons of cake; the “cake” strategies helped create the right conditions for learning in my classroom and established our fruitful and mutually respectful relationship – the development of the boys’ writing skills was achieved through relentless hard gritty work. It’s not about keeping disengaged boys entertained; success with disengaged boys comes from them realising they can be successful. My mantra is Fewer (activities) Deeper (learning) Better (student outcomes). Find a great stimulus material for inspiring writing. I chose Norman Mailer’s account of the Muhammed Ali vs George Foreman Heavyweight Championship fight called The Fight and Leon Gast’s film of the same event, When We Were Kings. Develop a leader of the group. If you can, identify a student who influences the climate for learning and who you know will be successful, and worry not about putting him on a pedestal! Tom is the boy I pedestalled. He was obsessed with Rugby League and played at a high standard; he’d had a difficult career at our school and our relationship with home was characterised by conflict. He grew into the leader of the class as he grew with the praise I heaped upon him, and the others grew with him. Through Tom I established the psychological conditions for growth in the classroom; my #PedagooLondon talk was largely based around a single line from his writing about the Ali-Foreman fight: I tried to hold up on Ali’s shorts but I went, just like a tree that had been chain-sawed. Encourage them to write raw first drafts. If you’ve read this blog before, you’ll know I used to be a good golfer when I was a youth. Jack Nicklaus, the best golfer to have ever lived, advised young golfers to hit the ball as far as they can when learning the game, and when they get older they can keep the length of their golf shots, but learn how to control them; it’s much harder to be controlled and then strive for length later. The same applies to the students’ writing – they should hit the ball as far as they can when they write their first drafts! Word-process their drafts for them, verbatim. Two lessons spent with them ham-fistedly typing will kill the process; I promise you this is worth the time investment. Teach them directly how writers choose words for impact! I don’t think there are many better examples of the impact of redrafting than the first sentence of Orwell’s Nineteen Eighty-Four. FIRST DRAFT: It was a cold, blowy day in early April, and a million radios were striking thirteen. SECOND DRAFT: It was a bright, cold day in April, and the clocks were striking thirteen. Orwell removes the disyllabic blowy and early so that, except for April, the final version begins with monosyllabic bluntness; he could have chosen March instead, but remember, April is the cruellest month. A million clocks is a vague exaggeration; he then considers innumerable clocks which is struck out because it is horribly awkward and he finally chooses the monosyllabic, the clocks. The eventual simplicity of the opening twelve words of the first sentence ensures there is no distraction from the sentence’s unsettling climax of the clocks striking thirteen. With this beautifully crafted periodic sentence Orwell communicates to the reader that something is wrong with the world of Nineteen Eighty-Four. Show them how great they are at writing already! Once they know how Orwell chose words for effect, you can point out to them the passages in their own raw drafts which have great impact on the reader. They then equate themselves with one of the best writers of the last century, and the germ of self-belief begins to grow. Teach the rigour of spelling, punctuation and grammar. Point out robustly that they have been taught SPAG since they were three years old, and that they know all the rules – they just cannot be bothered to abide by them! Choosing words for impact and SPAG comprise the toolkit for redrafting. Once they have understood how word choice has impact and how to punctuate, they redraft their own work – which you have word processed verbatim – for impact and accuracy. Celebrate! When they had finished their final pieces of writing they chose a picture to accompany their piece and I published their efforts in a single volume, sending a copy home with a covering letter to all their parents. Tom’s final contribution is on page 11. By the way, what would you save if your house was burning down? 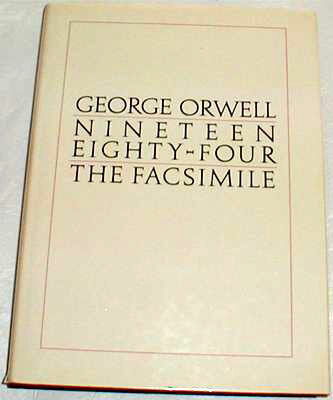 My copy of Nineteen Eighty-Four: The Facsimile would be amongst my preservation priorities, despite how heavy it is! Grit or flow or resilience or whatever? The peerless David Didau is so insightful on this key issue in his blog, gloriously entitled Grand Unified Theory of Mastery http://learningspy.co.uk/2013/03/10/the-grand-unified-theory-of-mastery/. In the end I reckon students need grit, and sometimes they’ll achieve flow. I think that if you teach them well they will approach writing grittily; then they will find they can write, when before they thought they couldn’t, and you’ll get flow, manifested in the occasional remark, Is that the end of the lesson already? It’s about relationships, stupid! By coincidence my son Joe was friended by Tom on Facebook this week and his opening gambit to Joe was, Now pal, how’s your old man? Tell him I was asking after him. I miss him a bit. So what is it that all students need for them to engage? When I wrote my original blog about teaching disengaged boys http://en.gravatar.com/mmiweb made this comment: In a sense why should we be surprised love (and I think that in its widest sense you are talking about loving the children) can conquer all. It’s something I shared with the inspirational Chris Waugh @Edutronic_net after I met him at #PedagooLondon and we agreed that fundamentally students need to feel loved. It’s that simple and that complicated to convince colleagues of such a truth. Looking into getting priimary aged boys to write well at the moment. A lot of this makes a lot of sense for 9-11 years as well. A great post with a lot of things to think about for me. Great post, John. One of best observations I’ve done was an English lesson for v disaffected y11 boys. V talented teacher used storm video by a tornado chaser to intro idea of writing weather poetry. Grabbed their imaginations straight off. By the end of the lesson students were all writing poems full of animal imagery – rhinos, bulls etc. V effective along with all the praise and relationship-building the teacher invested in. I love it! I’d love to work in your school, and I’m not even a teacher (though I hope I’m a learner and I do work with teachers) I’m passing this on to someone who’s just taken on a head of English role in a boys’ school which has just come out of special measures. I know she’ll really value it. I wish everyone could manage the love thing. I think it starts from within. If teachers can accept (=love) themselves, they have the confidence to put students’ needs ahead of their own and seek support when they’re struggling, rather than pulling up the drawbridge and letting know one in (metaphorically and actually). A fascinating post, John, and your original blog on this subject is great as well. This reminded me so much of my first GCSE English group, who were all borderline C/D students and many of whom were pretty disaffected. My ‘great stimulus’ for learning about poetry was to present them with a load of songs written out as though they were poems. These included Meatloaf’s Bat out of Hell and Springsteen’s Born to Run. After studying the tone, metaphor, etc. within the (song) poems, I played them the music. Suddenly they could see that songs are basically poems set to music, many of them with the same elements. 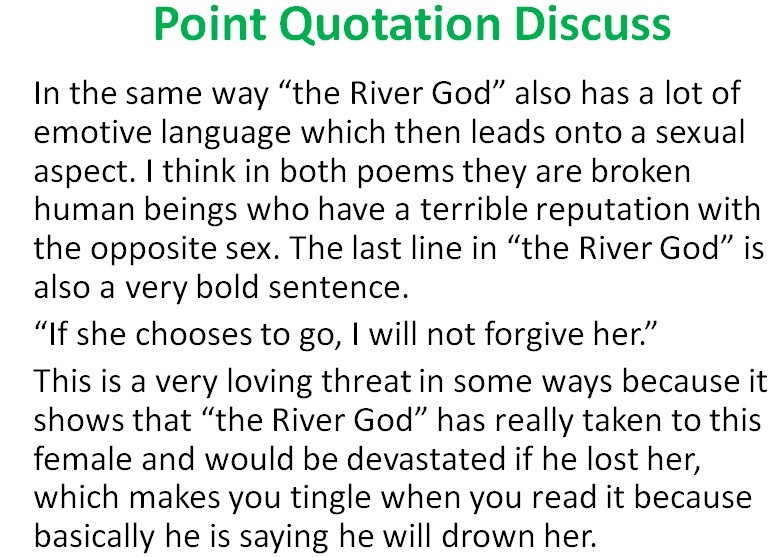 Great way to hook them into poetry. You mention typing out your boys’ writing for them. The fact that schools don’t teach children to touch type is a real bug bear of mine, because as you’ve seen that two finger pecking slows down any chance of flow within their writing. I have just found an absolutely brilliant touch typing computer game for my own children. It’s called ‘Pokemon Typing Adventure’ and my 7 year old has now started to learn to touch type using it. She’s already learning really quickly, within days of starting the game. I would love to see schools teaching touch typing, perhaps via a computer game/program such as this. We do so much on ICT, but typing is still really at the centre of computer use and we don’t bother with it at all. Valuable perspective. My charity @UK_Flagship is taking 16+ year old NEETs to sea in a sail training ship and offering them an innovative and inspiring learning schedule. Numeracy and literacy top our agenda. Keen to learn from others’ experiences! Brilliant ideas and writing stimuli! I’ve stolen all the examples to inspire my Y11s. Thanks, as ever, for sharing. K.
Very encouraging to hear that a school teacher uses this approach. I have been teaching NEET young people aged 11 upwards for several years and soon came to the conclusion that love is the answer. So I’ve experienced, as a teaching assistant supporting groups in early writing stages, both early primary and secondary special needs, that I have very much wanted to write their ideas at the speed they say them, and separate out the composition of sentences from the process of scribing. Of course these are both skills they need to learn, but given there is a huge shortage of verbal listening to extended speech by children, having their written work limited by their scribing skills has a lasting damaging effect on lower achievers willingness to try and get thoughts onto paper. Imagining writing whole sentences in two foot high painted letters goes someway towards it for me – I know that unless I write by hand first I can’t spell a long word when the process of scribing is that slow. Fantastic teacher who gets involved with “the boys”. Coincidently I have just told my friends about when my English/headteacher when he wrote about me in his blog. Five years on this still puts a smile on my face and I can remember our lessons from beginning to the end. Made my school days bearable.